Palouse’s solar power farm is up and running! One more step in our efforts to become a greener city. 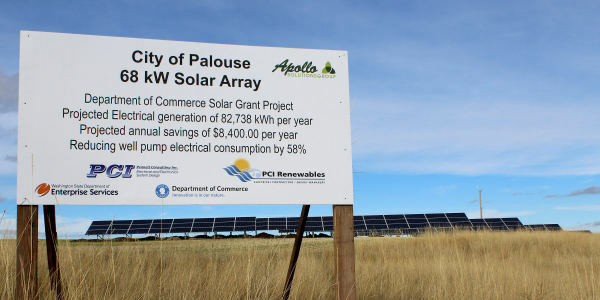 Completed in the fall of 2016, the City of Palouse commissioned a 68.04 kilowatt solar array which will provide energy to offset the cost of running the City’s wells and water supply. 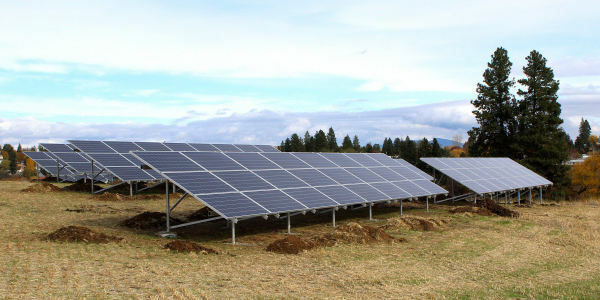 The system is comprised of 215 solar modules with 9 inverters to convert the energy for connection to the Avista grid. The system is guaranteed to produce 82,738 kilowatt hours per year, which equates to an average cost reduction of $700 per month to the City. Any excess power generated over the City’s needs will be credited by Avista to further reduce the City’s electrical utility costs. The City thanks Apollo Solutions Group and PCI Renewables who worked together to complete this design-build project and partnered with us to secure funding, which included grants from the State of Washington and production incentives offered through Avista Utilities. You can view power production online in real time.